Eisler Liván Hernández Carrera (Spanish pronunciation: [liˈβan erˈnandeθ]; born February 20, 1975) is a Cuban former professional baseball pitcher in Major League Baseball. He is the half-brother of pitcher Orlando "El Duque" Hernández. Liván Hernández is a baseball player from a poor family in Cuba. He was born in Villa Clara Province. After meeting recruiter Joe Cubas in Venezuela in 1994, the two planned an escape through Mexico. At the age of 20, Hernández gave up his $6 a month job as an official Cuban athlete and defected to the United States in 1995. His half-brother, Orlando, would defect two years later. Hernández has played for the Florida Marlins (1996–1999), the San Francisco Giants (1999–2002), the Montreal Expos (2003–2004), the Washington Nationals (2005–2006, 2009–2011), the Arizona Diamondbacks (2006–2007), the Minnesota Twins (2008), the Colorado Rockies (2008), the New York Mets (2009), the Atlanta Braves (2012) and the Milwaukee Brewers (2012). He bats and throws right-handed, and is known for throwing a "slow hook" curveball, sometimes below 60 miles per hour, as a strikeout pitch. A two-time All-Star, Hernández was considered to be a great defensive pitcher, having made just fifteen errors in his career. He is described as a workhorse; he throws many pitches, pitches many innings, and makes every start he needs to provide his team's bullpen much rest. Between 1998 and 2007, he never pitched fewer than 199 innings in any given season (in 1999 he threw only 199 2⁄3 innings). Hernández led the National League in innings pitched in three consecutive seasons, 2003 through 2005, and led the league in complete games for the first two of those years. In 2005, he once threw 150 pitches in nine innings, although the game went into extra innings after he left. In 2004 and 2005, he led the major leagues with 3,927 and 4,009 pitches, respectively. Hernández also is a dangerous hitter, helping his own cause with his bat, and won the Silver Slugger Award at the pitcher position in 2004. Hernández's actual age has been the subject of debate. Some believe he is older than his given birthday. After meeting with numerous team officials in the Dominican Republic, he signed with the Florida Marlins in order to live in Miami. He made his first appearance for the team as a September call-up in 1996, and joined the team for good in June 1997. His rookie season in 1997 coincided with the recent expansion franchise reaching the 1997 World Series. He started and won Games 1 and 5 of the series against the Cleveland Indians, and struck out a postseason-record 15 batters in Game 5 of the NLCS against the Atlanta Braves. His efforts earned him the World Series MVP trophy. Before Game 7, Hernandez was able to meet his mother, Miriam Carreras, for the first time in two years. The moment was the result of concerted efforts by the Cuban and United States governments as well as a written plea from the entire roster of players. His mother and sister now reside in Miami. On July 25, 1999, the Florida Marlins traded Hernández to the San Francisco Giants for minor leaguers Nate Bump and Jason Grilli. Hernández would go on to pitch in five postseason games during his stint with the Giants, one in 2000 and four in 2002. During the 2002 postseason, Hernandez had a record of 1-2 with an ERA of 6.20. On March 23, 2003, following his loss in game seven of the 2002 World Series, Hernández, along with infielder Edwards Guzmán, was traded by the Giants to the Montréal Expos for relief pitchers Jim Brower and Matt Blank. From 2003 to 2005, Hernández led the National League in innings pitched, and led the League in complete games 2003 and 2004. Hernández was selected to represent the Expos at the 2004 All-Star Game in Houston, Texas. This would turn out to be the first of two selections to the Midsummer Classic for Hernández during his career. 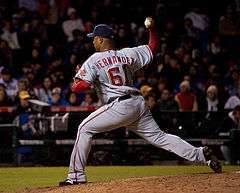 Between the 2004 and 2005 MLB season, the Montréal Expos franchise, with Hernández in tow, relocated to Washington, D.C. to become the Washington Nationals. Hernandez started, and won, the first major league game in Washington since 1971, defeating the Arizona Diamondbacks 5-3. In 2005, Hernández would once again lead the National League in innings pitched, as well as earn his second All-Star selection. After the 2005 season, Hernández had knee surgery, and his performance in the first half of 2006 suffered. At the All-Star break, he had a 5.64 ERA and allowed hitters a .308 average. But over his last five starts with the Nationals, he had a 3.27 ERA with four walks and 23 strikeouts. 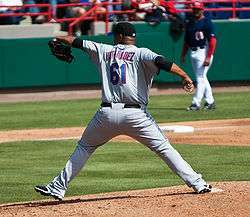 On August 7, 2006, Hernández was traded from the Nationals to the Arizona Diamondbacks for two young pitching prospects, Matt Chico and Garrett Mock. He led the majors in home runs allowed in 2007, with 34, and had the lowest strikeout-to-walk ratio in the Major Leagues (1.14). On February 12, 2008, Hernández signed a one-year deal with the Minnesota Twins worth $5 million, with an additional $2 million for performance bonuses. Through July 20, 2008, Hernández led Minnesota Twins starting pitchers with 10 wins and 127.2 IP. He was 10–6 with 5.29 ERA and 47 strikeouts. On August 1, 2008, Hernández was designated for assignment to make room for Francisco Liriano. Hernández with the Rockies in 2008. On August 6, Hernandez was claimed off waivers by the Colorado Rockies, and had a record of 3–3 with 13 strikeouts in 40.1 innings and finished the 2008 season there. Hernandez ended 2008 having given up 12.9 hits per 9 innings, the highest rate in the majors, had a major-league-worst .342 batting-average-against, and his 3.4 strikeouts per 9 innings pitched were the lowest rate in the major leagues. Batters also made contact with his pitches 91.3% of the time that they swung at them, easily the highest percentage among major league starters. Hernández with the Mets during 2009 spring training. On February 14, 2009, Hernández signed a minor league deal with the New York Mets. He won the fifth spot in the rotation, and was added to the major league roster when his turn came up on April 11. In 2009, Hernández was one of only three active players, along with Derek Lowe and Brad Ausmus, to have played 12 or more seasons without going on the disabled list. Hernández securely established himself as a dependable starting pitcher early in the Mets' 2009 pitching rotation. On May 26, 2009, Hernandez threw a complete game, giving just one earned run through his nine innings courtesy of an Adam Dunn home run in a 6–1 win over his former club, the Washington Nationals. He was the 1st pitcher to throw a complete game in Citi Field. He became the only active player that have thrown a complete game with six different teams. However, after struggling greatly in July and August, Hernández's job was put in jeopardy. After a 6–2 loss to the Diamondbacks, manager Jerry Manuel decided to start Hernandez against the Giants, who handed the Mets a 10–1 loss on August 17, 2009. Subsequently, on August 20, 2009 the Mets released Hernández to make room for Billy Wagner on the active roster. On August 26, 2009, Hernández re-signed with the Nationals, where he finished the season. On February 24, 2010, he signed a minor league deal to stay with the Nationals. He was called up on April 11. Hernández went 10–12 with a 3.66 ERA in 2010 and agreed to a one-year contract extension with the Nationals after the season. He was the starting pitcher on Opening Day of the 2011 season, his fourth Opening Day appearance for the franchise. On August 30, 2011 against the Atlanta Braves, Hernandez threw his 50,000th pitch of his MLB career, getting Jair Jurrjens to ground out and end the inning. Since 1988, only 11 pitchers have thrown more pitches. On January 31, 2012, Hernández signed a minor league contract with the Houston Astros with an invitation to attend spring training. He was released by the Astros on March 30. Within hours of being released by the Astros, Hernández was signed to a one-year Major League deal by the Atlanta Braves as a relief pitcher. On May 5, 2012, he recorded his first career save in his 485th major league appearance. On June 19, 2012, he was released from the Atlanta Braves. His release came after his relief appearance on June 10 where he allowed seven hits (including two home runs) in just 1.2 innings as the Braves were defeated by the Toronto Blue Jays. On June 22, 2012, Hernández signed a one-year deal with the Milwaukee Brewers. Following the season, he was removed from the 40-man roster and opted to become a free agent. After not playing in the Major Leagues for a full season, Hernández officially retired from professional play on March 13, 2014. As a young man, Hernández had a fastball in the mid-90s, a slider, and a changeup. With age he has become a finesse pitcher who relies on locating his pitches rather than generating great pitch speed. His primary pitch is a sinker sitting at 83–87 mph. He also has a four-seam fastball in the same speed range. Another main pitch, used mostly against right-handed hitters, is a cut fastball at 79–82. His off-speed offering to right-handers is a curveball ranging from 65–70 mph. Against lefties, he also adds a changeup in the upper 70s. His four-seam fastball was the slowest among all MLB starters in the 2011 season. Hernández has been an excellent fielder throughout his career, finishing seven full seasons without making an error. As of 13 September 2014, he owns the 24th-best fielding percentage all-time among pitchers. ↑ "Very few quality starters will be available this winter – MLB – ESPN". Sports.espn.go.com. August 23, 2007. Retrieved July 22, 2010. ↑ "Account Suspended". Frontrowsportsreport.com. February 12, 2008. Archived from the original on June 29, 2008. Retrieved July 22, 2010. ↑ "Marlins Send Ex-hero Hernandez To Giants". July 25, 1999. ↑ "Livan Hernandez Postseason Pitching Gamelogs". September 22, 2012. ↑ Svrluga, Barry (August 8, 2006). "Hernandez Is Traded To Arizona". The Washington Post. Retrieved July 22, 2010. ↑ "2008 Major League Baseball Standard Pitching". Baseball-Reference.com. Retrieved July 22, 2010. ↑ "2008 Major League Baseball Batting Against". Baseball-Reference.com. Retrieved July 22, 2010. ↑ "Major League Leaderboards » 2008 » Pitchers » Plate Discipline Statistics | FanGraphs Baseball". Fangraphs.com. Retrieved July 22, 2010. ↑ Noble, Marty (February 14, 2009). "Mets reach Minors deal with Livan". MLB.com. Retrieved August 31, 2012. ↑ Noble, Marty (March 31, 2009). "Mets round out roster for Opening Day". MLB.com. Retrieved August 31, 2012. ↑ Rogers, Carroll (May 1, 2009). "Atlanta News, Sports, Atlanta Weather, Business News". ajc.com. Retrieved July 22, 2010. ↑ "Washington Nationals sign Livan Hernandez" (Press release). Washington Nationals. August 26, 2009. Retrieved August 31, 2012. ↑ Ladson, Bill (February 24, 2010). "Livan back in DC with Minor League deal". MLB.com. Retrieved August 31, 2012. ↑ "Nationals add Hernandez and Bernadina to roster, place Morse on D.L. and option Mock to Syracuse" (Press release). Washington Nationals. April 11, 2010. Retrieved August 31, 2012. ↑ "Atlanta Braves get Livan Hernandez after Houston Astros cut". ESPN.com. March 30, 2012. Retrieved August 31, 2012. ↑ O'Brien, David (May 6, 2012). "Braves beat Rockies 13-9 on another big comeback". The Atlanta Journal-Constitution. Retrieved August 31, 2012. ↑ Ladson, Bill (March 12, 2014). "Livan to make retirement official". MLB.com. Retrieved March 12, 2014. ↑ Corcoran, Cliff (March 13, 2014). "Livan Hernandez officially retires, ending compelling 17-year career". Sports Illustrated. Retrieved March 13, 2014. ↑ James, Bill; Neyer, Rob (June 15, 2004). The Neyer/James Guide to Pitchers: An Historical Compendium of Pitching, Pitchers, and Pitches. Simon and Schuster. p. 241. ISBN 9780743261586. Retrieved August 31, 2012. ↑ Comak, Amanda (April 23, 2011). "The amazingly durable Livan Hernandez". The Washington Times. Retrieved August 31, 2012. ↑ "Brooks Baseball · Home of the PitchFX Tool - Player Card: Livan Hernandez". Brooks Baseball. Retrieved August 31, 2012. ↑ "PitchFX Leaderboards". Baseball Prospectus. Retrieved September 18, 2012. ↑ "Livan Hernandez Statistics and History". Baseball-Reference.com. Retrieved August 31, 2012. Wikimedia Commons has media related to Liván Hernández.